Everybody makes mistakes (or so they tell me). Despite the often vast reserves of experience and expertise of search marketers (as well as all the information available on the 'Net such as what is available within Website Magazine's Mastering Search channel), mistakes and errors of all kinds are common. Despite how perfect we want our Web presence to be, it's just a part of operating in the digital landscape today I guess, no matter how hard enterprises might try to resist. This reality, of course, also applies and extends to the development of Web pages - specifically, the construction of HTML (hypertext markup language). Google and other search engines crawl your website - that much you should know (how else would they know what it's about! ), and the number of opportunities they find where websites could be improve could definitely offer up a virtual surprise. Those using Google's Search Console, in fact, are provided a special report about the issues Googlebot has found on their site and often times it goes unnoticed (or ignored altogether) by those new to the practice of search engine optimization. Making this report a regular visit in your ongoing SEO initiatives however can definitely help you move, albeit slowly, up the search results pages. What can you find in the HTML improvements report in Search Console from Google? Let's take a closer look now. 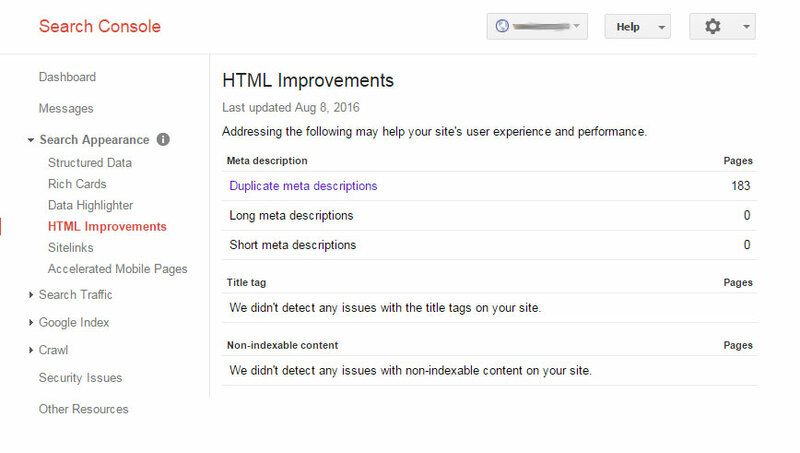 + It's important to note here that the issues reported in Search Console within the HTML improvement report don't actually prevent a site or page from being crawled and indexed, but they will help to improve the user experience and as a further consequence, do carry the potential to increase the traffic a site thanks to higher rankings. Obviously the site you're optimizing must be added and verified within your Search Console account, but once that's done, SEO's and webmasters will find useful data including problems associated with their titles, meta-descriptions, and even the non-indexable content that Googlebot identifies. Webmasters might also pages reported that have meta-description problems, again, those missing or of a duplicate nature to others, or those which are "too short" or "too long" (although you'll be hard pressed to get Google to tell you what the minimum or maximum threshold is, so good luck. As you can see in the example (screenshot) below, this website has several duplicate meta-descriptions. Clicking the link will reveal which pages Googlebot has identified as having duplicate meta-descriptions..
Google will also show non-indexable content, pages that contain content rich media files, video or images that can't be indexed - and thus not ranked... ever. Google's Search Console is an important part of search engine and digital optimization. Over the next few weeks, Website Magazine editors and contributors will be focusing on the opportunities that can be gained by leveraging this resource. In the meantime, what guidance do you have for SEO newbies when it comes to Search Console? Share a comment now and get the conversation started.